Week of February 9, 2015 | 1-2-3 SPORTS! 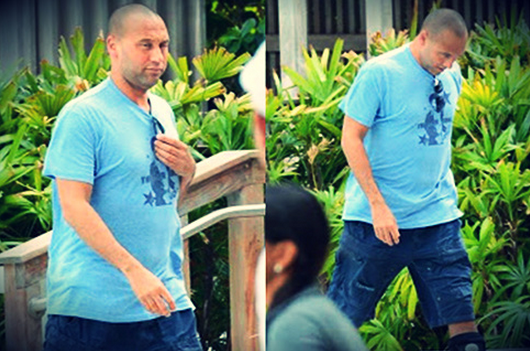 The only Derek Jeter I like is a fat, retired Derek Jeter. We are Facebook official folks. Like our page and join the conversation. PAL: I knew about Tark challenging the NCAA, but I had no idea about Dean Smith’s activism. Considering when and where he was doing this, it’s even more impressive, and I better understand why people like Michael Jordan held him in such high regard. TOB: A few months ago, Phil told me he was looking for a new car, and in particular that he was looking at a VW Westfalia van. I was all for it. Those vans are awesome. We had a VW van when I was a kid, but not a Westfalia. Phil ultimately bought a taxi cab. None of which is relevant, except to lead into this: I am fully on board with Daniel Norris’ life decisions. In fact, I am really jealous. This dude (1) is 21 years old and (2) has $2M in the bank, (3) is a professional baseball player, (4) lives in a dope van (5) surfs a bit, (6) has a solid beard. He is truly L-I-V-I-N. It’s also Reason #5,988 why baseball is better than football. If a top-10 projected NFL prospect told teams he was thinking of stashing away his signing bonus and living in a van down by the river, he’d fall to the 7th round because he doesn’t “want it” enough. PAL: “Ted did not sacrifice one aspect of his life for another.” The more I think about this line, the more I think it’s one of the nicest things that could be said about a person. Agu’s is a sad story that on most days gets pushed through the pipe filled with other sad stories, so it’s comforting to be reminded the legacies of the relatively common of us live on – not only in memory, but in the thoughtful words of a friend. TOB: I feel like this article is what 1-2-3! was made for. We are putting out a call: What athlete do you hate? What athlete did you hate growing up? It can be rational or irrational. Tell us who it is, and why at our brand new Facebook page. Show your work. TOB: In a perfect world, Phil’s wishes would be reality – all U.S. cities would collude and tell professional sports teams to build their own stadiums, or go pound sand. But, the problem is analogous to running a sports team. When you are a coach or a GM of a team, your interest is short-term due to concerns for job security. If you’re a coach, you are going to try to win games at the expense of developing your young players. Young players need time to develop, but they also lose while they figure it out. GMs will bargain with the future of a team in order to help the team in the present. Similarly, local politicians are in a tough spot. If they let a professional team leave, they will be largely despised. If they manage to keep a team who is looking to leave, they are received as a conquering hero (See: KJ). Their duty should be to the public, but on a human level, I get the need to look out for themselves and their families, too. With that said, I appreciate that the leaders of Detroit are at least trying to come up with a compromise – if you want public money for your palace, you better guarantee locals will get jobs to build it. We can build on this. TOB: This really pisses me off. I feel for the kids – it is not their fault. They played the games and do not deserve this. However, unlike some, I stand by Little League’s decision: the best way to combat this problem is to deter it, and the only way to deter it is to strip any value from it. Not that this will stop this sort of thing completely – it seems that adults have been trying to game the LLWS system since its inception, but if they let this slide, they would be incentivizing adults to do this in the future. This entry was posted in baseball, basketball, feel good, football, ncaa and tagged austin knoblach, bill bradley, brennan scarlett, cardale jones, charles pierce, daniel norris, dean smith, jerry tarkanian, john feinstein, john paschal, johnie gall, little league, stadium subsidies, ted agu, the daily californian. Bookmark the permalink. Pingback: Week of March 22, 2015 | 1-2-3 SPORTS!